Recently there have been some notable posts that cover the main motivations why people swing dance. The Hidden Reason Why We Become Swing Dancers on Dance World Takeover started it off using challenge as the main motivation for why people swing dance. the hidden reason we become lindy hoppers: a response on move(me)nt responded by listing community as the primary factor. A Shared Challenge on Dancing Past the Godzilla Threshold responds with his main motivation is sharing a moment on the dance floor with someone else. For myself I have a primary reason why I dance and a secondary reason that helps to allow the primary to happen. I think a lot of individuals are in the same boat of myself that while there may be a primary reason, there are a variety of secondary reasons as well. An example of this is why I like dancing in Montreal. My primary reason is because they have a great dance scene that is fun to visit. However my secondary reasons are because I like the opportunity to practice my French and they have delicious food. “The Spark” is my nickname for those moments in dance that just blow your mind and are indescribable. At the risk of coming off completely insane, it is this feeling that you can’t tell who or what is in control but one is almost possessed and have this feeling of invulnerability that causes you to just own whatever you are doing or click with another person on this almost ethereal level. When Greek mythology spoke of the concept of a genius, this is the closest I can think of what they were talking about. “Owning it”, “Killin it”, “Being on Fire”, and the other names for what people refer to this as… this is the primary reason why I dance. Those moments are rare, but I am constantly seeking them out. 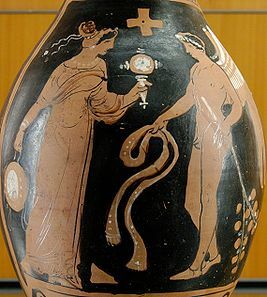 Blatantly stolen from wikipedia: "Winged genius facing a woman with a tambourine and mirror, from southern Italy, about 320 BC." Challenge is my secondary reason because they make the possibility of “The Spark” happening. Having clean basics allows me have a clear line of communication with the lead or follow I am dancing with. Constantly tackling new material or refining what I have allows me to have more tools in my toolbox to match whatever the music and my partner is giving me in a dance. I have days when I don’t feel like practicing my triple steps and would rather instead watch television or eat ice cream, but my primary motivation to dance works to feed my secondary one. I first joined Lindy Hop because at a house party I saw people swinging out and I wanted to learn that. As a natural extrovert, meeting people and making new friends has never been that difficult of a thing for me. I started traveling because I realized to get better I had to visit areas with opportunity to learn from experts. Only after awhile in the travel circuit did I make bonds with some folks and community became an influence in why I danced. I have always felt odd that I didn’t start because of a friendly gesture or a pretty girl like many other leads. If I have learned anything from all these posts it is two things. Why individuals dance Lindy Hop is not a simple thing that can be defined by one reason, it is a tapestry that encompasses multiple motivations which vary from person to person. No person is an island. While many of us have different motivations, you can almost certainly find someone with similar ones to your own. This entry was posted on April 16, 2012 by Apache. It was filed under Dance, Lindy Hop . Beautifully said — especially the end. To me, the best part about all the posts that are coming up is seeing the different ways people are motivated in their dancing. Also, you describe that moment of pure inspiration and awesomeness in a way that I completely understand — because honestly, those moments are incredible. All the best in your Spark-hunting!